A giant asteroid will miss the Earth tonight by two million miles, and the fly-by will be caught on live stream. An asteroid the size of three football fields will zip by the Earth tonight at 27,000 mph, and the fly-by will be live-streamed for your viewing pleasure. 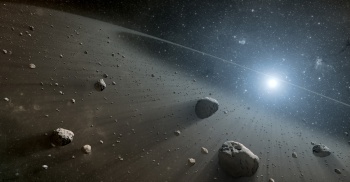 Dubbed 2000 EM26, the asteroid is roughly 885 feet in diameter and will miss our planet by two million miles - or about 8.8 times the distance between the Earth and the Moon. Slooh.com and Space.com will stream the event live tonight starting at 9 p.m. ET. 2000 EM26 was discovered on March 5, 2000 and is classified as a "potentially hazardous object" - in other words, its orbit has the potential to make close approaches to the Earth, and the asteroid is large enough to cause significant regional damage if an impact occurs. A member of the Aten family of asteroids, 2000 EM26 is not the first Aten asteroid to get media attention; in 2004, it was believed that 99942 Apophis would hit our planet in 2029, but further observations have eliminated this possibility. Available to the public since 2004, Slooh is the first robotic telescope service that allows for live viewing through your browser.